Police have released CCTV images of two people they wish to identify after a Southam burglary. Investigations are ongoing for the robbery that was reported to police on Sunday April 9 at 3.25pm at a premises on Southfield Road in Southam. 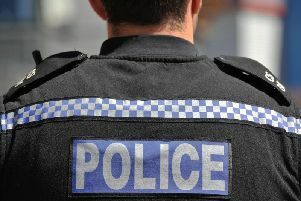 It was reported that two male offenders forced entry to the premises and made off with a computer and tools. Offender 1 is described as a white man, approximately 6ft tall with a heavy build, wearing a grey tracksuit. Offender 2 is described as a 5ft 6ins tall man of medium build, wearing a blue hooded jacket and glasses. Anyone with any information regarding the incident, or may have witnessed any suspicious activity in the area at the time, should call police on 101 quoting incident 128 of 10 April.